Fusion is developmental anomaly recognized as a union of two separate tooth buds at some stage in their development with the confluence of dentin; pulp chambers and canals may be joined or separate, depending on the amount of development at the time of union. This union of two separate tooth germs may be either complete or incomplete and can be noted clinically by the presence or absence of a groove or indentation separating the two teeth. Epidemiological studies showed that the incidence of fused teeth was similar for males and females and occurred most frequently in the deciduous dentition. The prevalence of tooth fusion was estimated at 0.5%–2.5% in the primary dentition, whereas prevalence in permanent dentition seemed to be clearly lower than in the primary dentition. This malformation can be distinguished from gemination as gemination is an attempt by the tooth germ to divide and to show the presence of two separate roots or a single root or by counting the number of teeth. There is one tooth fewer than the normal count for the arch, if the affected tooth is counted as one. For a differential diagnosis between these anomalies, the dentist must carry out highly judicious radiographic and clinical examination. Although its etiology is not exactly known, it is believed that some physical forces or pressures cause the contact of developing teeth. Pressure from the adjacent tooth follicles, as well as hereditary conditions or racial differences, has been speculated to be the cause of fusion. Canines and lateral incisors are the most frequently involved teeth in cases of fusion. The purpose of this article is to highlight the rarity of the condition and to evaluate the presence of any pathology [Figure 1] and [Figure 2]. A 5-year-old girl reported to the Department of Pedodontics and Preventive Dentistry with the complaint of having decayed teeth in relation to her left lower back tooth region of the jaw. Medical history appeared noncontributory. There was no family history of dental anomalies, and no consanguinity was reported in the parents. Intraoral examination revealed dental caries in 55, 74, and 75 along with unilateral the presence of unusually large teeth in the right lower incisor-canine region, suggestive of conjoined primary lateral incisors, and canines. Deep labio-lingual grooves were associated with the enlarged teeth. The right primary mandibular canine was missing, confirming that it was a case of fusion and not germination. The morphology of 82,83 seemed to be Type I: Bifid pulp chamber and normal sized root canal with a slight widening in cervical portion. The fused teeth 82,83 had smooth labial and lingual surfaces. The fused 82,83 had an incisal ditch with a labial groove. Fused teeth were also caries free. Since there were no carious lesions present, a preventive approach was planned. It consisted of topical fluoride application, dietary changes, and periodic follow-ups. The patient was put on a 3-month recall. Developmental dental disorders may be due to abnormalities in the differentiation of the dental lamina and the tooth germs that are anomalies in number, size, and shape, or due to abnormalities in the formation of the dental hard tissues. A fused tooth is clinically broad and shows either a bifid crown, a groove delineating two crowns, or an incisal notch. The groove may continue onto the root if they are also conjoined. The terms such as “connate teeth,” “double formations,” “synodontia,” or “joined teeth” are often used to describe fused teeth. The etiology of double teeth may be attributed to evolution, trauma, heredity, and environmental factors. Etiological factors could be physical forces or pressure causing the contact of developing teeth, trauma, and viral infection during pregnancy, or genetic basis possibly autosomal dominant with reduced penetrance. 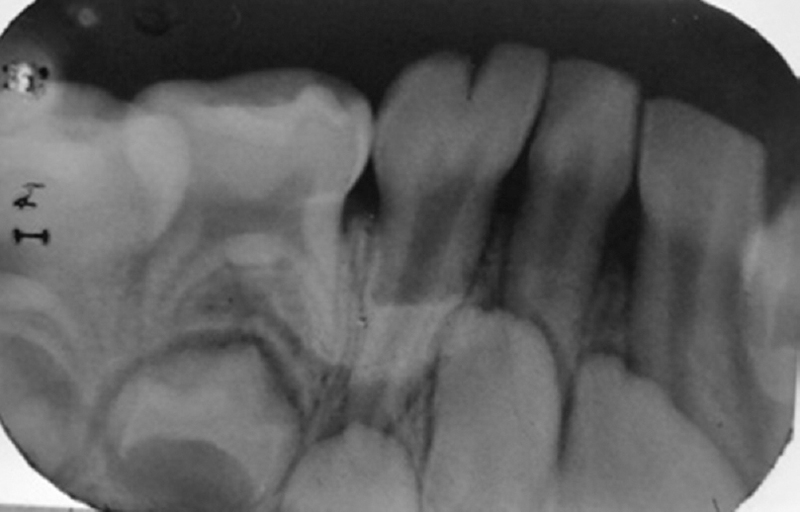 Thalidomide embryopathy may induce dental fusion. Fusion has also been reported with congenital anomalies such as cleft lip and with X-linked congenital conditions. The crown incorporates features of both participating teeth with regard to their enamel, dentin, cementum, and pulp. The tooth might exhibit separate crowns and fusion may be limited to the roots alone with pulp canals fused or separate. The problems associated with this anomaly include esthetics, possible loss of arch length and delayed or ectopic eruption of the permanent teeth, caries along the line of demarcation, early pulp exposure due to deep grooves, and periodontal abscesses. The greater root surface area of fused primary teeth may delay its resorption. Strict oral hygiene is imperative to maintain periodontal health. Hagman reported that such patients have a 75% chance of lacking the succedaneous lateral incisor. The management of a case of fusion depends on which teeth are included, the level of fusion, and the morphologic result. The treatment of choice depends on the patient's orthodontic, periodontal, esthetic, and functional requirements. If the fused tooth is free from caries, it may require no particular treatment. Universal preventive advice should be given to the parent and the child, and in the case of presence of caries, restoration should be placed for the retention of the function and esthetics. When the pulp and canals are separated, different approaches have been suggested including (a) the separation and extraction of the anomalous tooth with orthodontic closing of the space and reshaping of the teeth, (b) surgical separation and restoration of both teeth, and (c) selective grinding of the fused teeth to reduce the crown width. In cases where there are esthetic concerns and no underlying risk factors, conservative use of tooth reshaping, direct composite bonding, bonded porcelain veneers, and crowns have been described. Successful management of these cases depends on the morphology of fused teeth and knowledge and skills of the practitioner. Hence, careful monitoring of the condition is recommended. The minimal intervention technique and preventive approach for the management of the fused teeth have to be advocated if the pulp exposure can be ruled out. Management of fusion warrants regular and long-term follow-ups. Duncan WK, Helpin ML. Bilateral fusion and gemination: A literature analysis and case report. Oral Surg Oral Med Oral Pathol 1987;64:82-7. 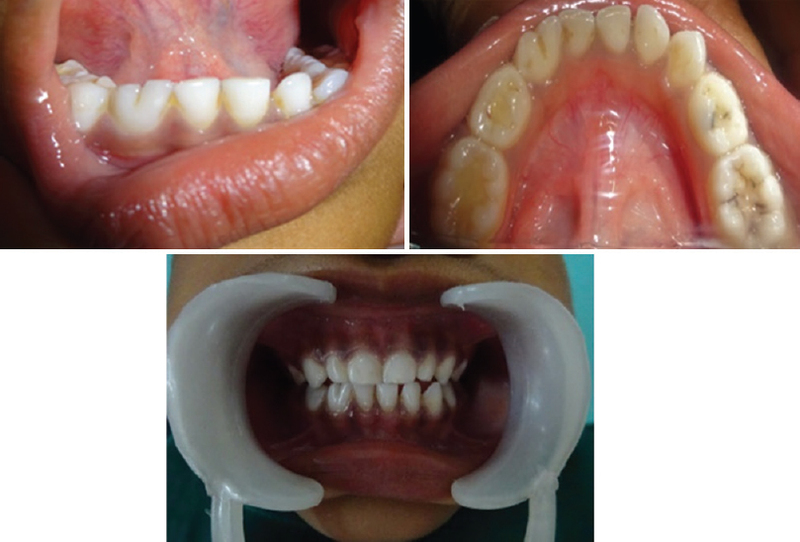 Milano M, Seybold SV, McCandless G, Cammarata R. Bilateral fusion of the mandibular primary incisors: Report of case. ASDC J Dent Child 1999;66:280-2, 229. Hülsmann M, Bahr R, Grohmann U. Hemisection and vital treatment of a fused tooth – Literature review and case report. Endod Dent Traumatol 1997;13:253-8. Turell IL, Zmener O. Endodontic therapy in a fused mandibular molar. J Endod 1999;25:208-9. Peyrano A, Zmener O. Endodontic management of mandibular lateral incisor fused with supernumerary tooth. Endod Dent Traumatol 1995;11:196-8. Neena IE, Sharma R, Poornima P, Roopa KB. Gemination in primary central incisor. J Oral Res Rev 2015;7:55-7. Penumatsa NV, Nallanchakrava S, Dandempally A. Fusion of mandibular primary incisors and their permanent successors: A case report with review of literature. J Oral Res Rev 2012;4:56-9. Sharma D, Bansal H, Sandhu SV, Bhullar RK, Bhandari R, Kakkar T. Fusion: A case report and review of literature. Journal of Craniomaxillary Disease 2012;1:114-8. Brook AH, Winter GB. Double teeth. A retrospective study of “geminated” and “fused” teeth in children. Br Dent J 1970;129:123-30. Hagman FT. Fused primary teeth: A documented familial report of case. ASDC J Dent Child 1985;52:459-60.